I did something on Sunday that I’ve never done before in my life: I took part in a fun run. At this point, I have to come clean and confess that I didn’t actually run, I completed the course at a steady yet springy walk, but I can confidently say that the entire experience was a whole lot of fun. 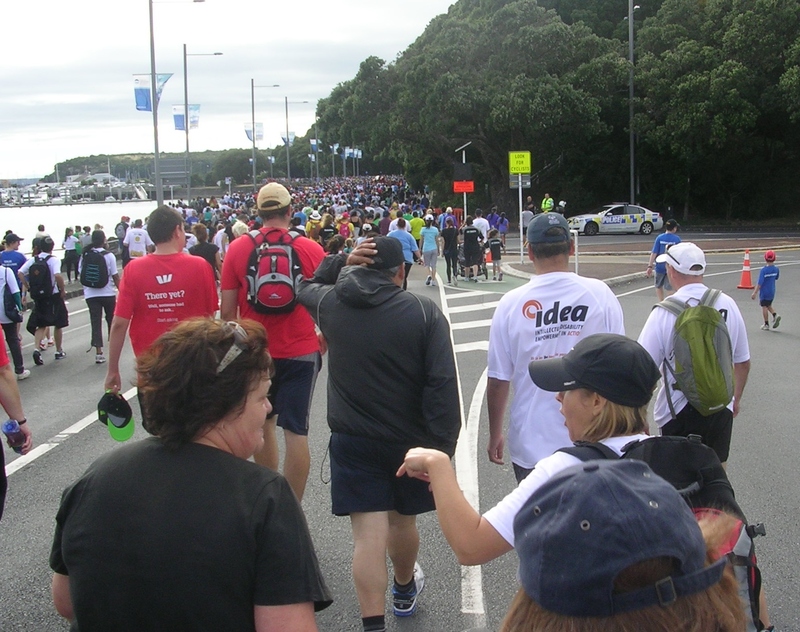 The fun run in question was the Round the Bays annual event which is 8.4km long over a flat course following the contours of Auckland’s Waitemata Harbour. It starts in the heart of the city on Quay St and snakes along the sinuous curves of Tamaki Drive, finishing on the waterfront at St Heliers Bay. The words that attracted me above all others were ‘flat course’ because I really am not at all a fan of walking uphill, so the thought of a group ramble, on the flat, in aid of some good causes, in pleasant company, was very appealing. Getting on for 30,000 people completed the course with the winner romping home in around 26 magnificent minutes which means he must have run each mile in roughly 5 minutes. Such was the volume of people that it took us walkers about 26 minutes to cross the start line meaning that that winged Mercury of a winner was whizzing across the finishing line just as we were getting going. My time was one hour and 43 minutes which means I took roughly 4 times as long as the winner. Should I be worried about this? I answer my own question by saying not for one single second should I be worried – the triumph is in the joy of the journey, not in how long it took to arrive. The course itself takes a tiki tour through NZ history. Leaving the city behind, we arrived at peaceful Okahu Bay, home to Māori known as Ngati Whatua. In the mid-19th Century, as the demand for land by European settlers increased, Ngati Whatua gifted land to the Anglican Church and the Crown, later on selling land to the government and to private settlers. But their understanding of these deals was based on the traditional Māori belief that land is a communal asset and the finality of these transactions in the European mind was alien to the Māori way of thinking. The government acquired and then sold more and more of it until the remaining members of Ngati Whatua in Okahu Bay were evicted in the 1950s and their homes, marae and communal buildings were pulled down. In 1976, some members of Ngati Whatua took a stand, occupying Bastion Point for 506 days, protesting against the sale of the last Crown-owned land. Some eight years later, they lodged a claim with the Waitangi Tribunal and were awarded compensation, title to returned lands and recognition as the tribal authority of the area. Further along, we bowled through one of my favourite places: bustling and beautiful Mission Bay which takes its name from the Melanesian Mission, founded by Bishop George Augustus Selwyn and based in the bay. The Melanesian Mission House was built from volcanic stone bought from Rangitoto opening in 1859 to coincide with the arrival of 38 Melanesians on board the Mission vessel, Southern Cross. Next along the way is quieter Kohimarama beach; its Māori name apparently means ‘gathering-in-of-light’. And it is the light which is so significant as we stride along beside the glittering sea scattered with white sailed boats bouncing about against the wide and vibrant sky. The course ends at charming St Heliers Bay, a name apparently suggested because of the resemblance to the bay at Saint Helier, a fashionable holiday resort on the Channel Island of Jersey. Sadly, St Heliers in Auckland appears to have lost its rightful apostrophe over time. In the 19th Century, St Heliers was usually reached by boat, the trip from Auckland taking only 30 minutes, whereas the eight mile land route via Newmarket, Remuera and Meadowbank took far longer. After Tamaki Drive was built in the late 1920s, St Heliers became a commuter suburb and a destination for a day out on a Sunday. On this particular Sunday it was the destination for thousands of runners and walkers who arrived in brilliant sunshine to be greeted with a bottle of water and a grass reserve scattered with tents offering food, information and all manner of other entertainments. All this at the end of a well organised event with water stations and even the Hare Krishna musicians to help us on our way. I could walk this route every single day if I wanted to, all on my own, at a time of my choosing and without paying for the privilege, but how much more agreeable to do it in company, to begin at the beginning and through perseverance, to get to the end, with so much to treasure in between. Sooo proud of you on this day! It makes me feel very guilty as I always said I would do something for charity! Thanks so much for these kind words and it’s so good to hear from you. It was a great walk on a wonderful day. But please don’t feel guilty – guilt is a terrible and negative thing which you can do without!